Aswani Homes – one name you can trust. The people running Aswani are first-generaion entrepreneurs with a strong background in logistics and resource management. The core team has legacy exposure in real estate and project development. Aswani is also behind the Springdale project in Hosur – a modern intelligently designed gated community within a 7-acre spread, with the best of amenities and facilities. The Group’s second project – Aswani Sitara is another good example in affordable housing, with “the complete, living blueprint”. This fully sold out project offered customers true value in terms of location, plans and project execution. What Aswani brings to the table is safe, legally watertight property investments backed by project handling capability that ties in experience, expertise and high standards. * Aswani Sitara – 2 & 3 BHK apartments in Chandapura, adjacent to KHB Surya City. * Aswani Sunshine – 2 & 3 BHK apartments on Sarjapura Road. Facilities at this project : Ample covered and open parking, play areas, swimming pool, gym. * Aswani Aaeesha – 2 & 3 BHK apartments in Electronic City Phase II. 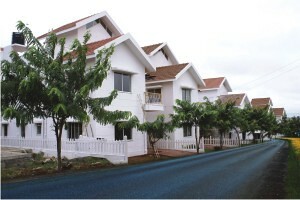 * Springdale – III – 31 independent villas on Rayakotta Road, Hosur. Facilities at this one-acre project : Private parking, play area & garden, swimming pool, gym, jogging & walking tracks, shopping complex.